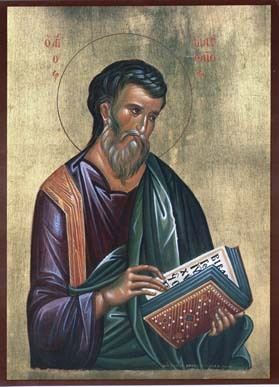 St. Matthew (meaning "gift of God") was identified as a tax collector (Matthew 9:9; 10:3) and was of Jewish race. In the other accounts of his meeting with Jesus (Mark 2:13, 14; Luke 5:27-29), he is called Levi. This use of two different names has led some scholars to argue for two different persons, due to the absence of Levi from the apostolic lists. Others, however, have argued that Matthew had a double name, because the Jews frequently carried two names - such as Simon/Peter and Saul/Paul. When he was called by Jesus (Matthew 9:9), Matthew renounced the position of tax collector and became His disciple. According to Christian tradition, after Pentecost Matthew, filled with the Holy Spirit, preached the gospel in many places, especially to the Jews. Matthew's usual emblem as an evangelist is a man, because his genealogy emphasized the family ties of Christ. He is commemorated in the Orthodox Church on November 16.